After being side-tracked by Madonna, I'm finally getting around to counting down my favourite songs from 1996. At the start of that year, I turned 21, but I still had two years to go on my university degree, so other than having a big party, it was pretty much business as usual for me. In fact, this was a song I'd been listening to since 1994, when it almost made my year-end top 10. Two years on, and "Reach" received a remix by Dancing Divaz in the hopes of improving its chart fortunes. Not only were songs that had never made the charts being remixed to try and turn them into hits, but now songs that had been relatively successful ("Reach" made it to number 17 in the UK in 1994) were remixed with the aim of turning them into even bigger hits. It didn't work, with "Reach 96" peaking at number 22. The same thing happened with Hyper Go-Go's "High 96" (number 101 on this list), which peaked at number 32 in the UK - two places lower than its original position. This single tried a similar tactic, by pairing a Masters At Work revamp of UK top 10 single "Always There" with new song "Jump To My Love" (taken from the acid jazz group's remix album). Unfortunately, the double A-side barely dented the UK top 30. Success, finally, for this do-over of 1991 single "Dream On (Is This A Dream)". Well, "success" is a relative term, since this new take on the song only reached number 39 in the UK - but that was 13 places higher than in 1991. A slice of Australian dance music now - and, in a nice coincidence, it's a track that took its hook from a song by the group at number 94. Love Decade's "I Feel You" just missed my top 100 for 1992, and it was reinvented in 1996 by two local DJs, who landed a top 20 hit on the ARIA chart for their efforts. Peewee Ferris is the better known of the two, thanks to his production and remix work over the years, as well as a series of Big Day Out appearances. Here's a song I remember dancing to a lot in 1996 - since it, together with a few other tracks that'll turn up on this list, was on high rotation at one of the clubs I spent a lot of Saturday nights that year. Unlike Candy Girls' over-the-top "Fee Fi Fo Fum" and "Wham Bam", it was just the right side of camp for my taste - but only just. Taking a pause from the barrage of club tracks, we find this song, which was featured in Romeo + Juliet and came from a Swedish indie pop group (is there no genre in which the Swedes don't make awesome music?). "You & Me Song" dated back to 1994, when it was titled "You And Me Song", but it took the rest of the world a while to catch on. After instant success with the singles from Find Your Way in 1993, British soul singer Gabrielle hit the jackpot again with this first single from her self-titled second album. The Motown-inspired feel was a bit of a change of pace, but the British public lapped it up, with the song sticking around in the top 10 there for weeks on end. She started her career as Canada's answer to Toni Braxton, with R&B tracks like this and "Sentimental" (number 161 on this list) performed in a similar husky style - but throughout the rest of the decade, thanks to a series of club remixes by the likes of Hex Hector and David Morales, Deborah was transformed into a dance diva. For me, she didn't release anything better than this track, which was her second single. A match made in handbag heaven. On the one hand, you had Hyper Go Go, who'd been behind such piano house classics as "High", "Raise" and "Never Let Go". On the other, there was one of the original house divas, whose songs "Warning!" and "I Thank You" had helped the genre cross over in the late '80s. Put them together and you have this club hit. They'd been around almost as long as acts like Incognito and Brand New Heavies had been landing hits, but it wasn't until 1996 that this British R&B/acid jazz group came onto my radar. Unfortunately, songs like this and "Special Kind Of Lover" (number 196 on this list) didn't get on enough other people's radars and they both just scraped into the UK top 40. Here's another group that'd been around for quite a while - a whole decade, in fact - but, unlike Nu Colours, the US ska-influenced group certainly made an impact in 1996. 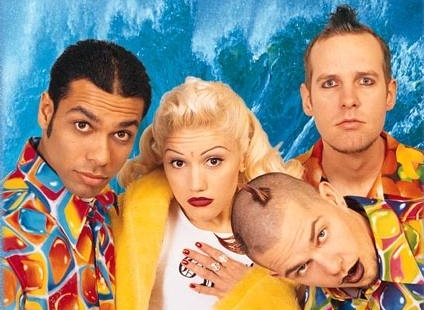 Singer Gwen Stefani had joined the line-up in 1989 but it wasn't until 1995's Tragic Kingdom that things started to take off. "Just A Girl" became their international breakthrough hit and, of course, even bigger things were to come in 1997, a year and a half after Tragic Kingdom had originally been released. I just discovered that the producer of Tragic Kingdom was Matthew Wilder, whose 1983 hit, "Break My Stride", received a new lease of life in 1996 due to a fairly awful Eurodance cover by Unique II. Speaking of Eurodance... this song started off as a La Bouche album track (oddly, their mega-hits "Be My Lover" and "Sweet Dreams" never appealed to me despite my love for other Eurodance tracks from the same era). American trio No Mercy covered the song, giving it a bit of a Latino twist, and hey presto, another global mega-hit. Now a decade into her solo career, Belinda was still able to come up with the pop goods - turning this flop Jenny Morris single into a big UK and Australian hit. Jenny's version had been released as recently as 1995, but the fact the song was written by Rick Nowels (also behind tunes like "Leave A Light On" and "Heaven Is A Place On Earth") no doubt brought it to Belinda's attention. "In Too Deep" was taken from her sixth album, A Woman And A Man, which also contained "Always Breaking My Heart" (number 93 on this list), a single written by Roxette's Per Gessle. With Massive Attack, Tricky, and the new and improved Everything But The Girl scoring huge sales with their downbeat electronica, the way was paved for a band like Sneaker Pimps, who scored their first hit with this song in 1996. "6 Underground" would be even bigger in 1997 after it had been featured on the soundtrack to the film version of The Saint. After releasing the best single of their career in the form of 1995's "He's On The Phone", Saint Etienne took a break for a few years, during which time vocalist Sarah Cracknell recorded a solo album, Lipslide, which featured this single. I actually preferred one of the remixes on the CD single, but you'll have to make do with the main single and video version below. Eighteen-year-old Anthony Kavanagh had been discovered by Take That's manager, Nigel Martin-Smith, and this debut single was co-written by TT member Howard Donald so you'd think it would have been a bigger UK hit than it was (it reached number 35 in 1996). Well, it was - in 1997, when the not-very-different "Crazy Chance 97" cracked the top 20. Another British pop act that took a while to warm up was three-piece boy band 911. They'd debuted with a cover of Shalamar's "A Night To Remember" (number 135 on this list) which just made the UK top 40. "Love Sensation" was their follow-up and it just missed the UK top 20, while their final single for 1996, "Don't Make Me Wait" (number 83 on this list), gave them their first hit inside the UK top 10, somewhere they'd be spending a fair bit of time for the following three years. In Part 2, one of my favourite '80s tracks reared its head again, while two incredibly successful Australian pop acts made their debuts.